It's Friends With Flair Friday and I am falling in LOVE! With bright colors, that is. Have you ever found yourself suddenly attracted to colors you NEVER used much in the past? I seem to have fallen head over heals in love with yellows, oranges, and I've even pulled out PURPLE! I don't know how that happened, but I'm not complaining, because, quite frankly...I'm kind of loving it. Just say'n. I pulled out the Unity I Adore You set by Echo Park and instantly felt the urge to ink up that frame in YELLOW! Then, I had stripes on the mind. Why stripes? Well, that probably had something to do with this Tuesday Trigger over at Moxie Fab World! Just say'n. Although, while I loved the subtle soft-tone colors in the inspiration photo...I was in a brights mood, so I gave those suckers a bit of a boost! So....that led to a ribbon background of a wide yellow silk, a narrow blue silk, and a simple white grosgrain placed in pretty, pretty stripes! 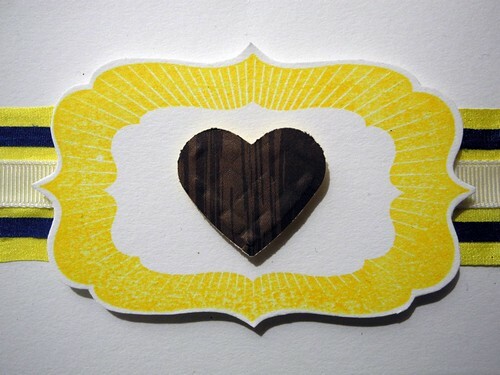 The embossed woodgrain heart (MS punch) balanced out the bright colors nicely. Then I stamped the sentiment in blue (CTMH Moonstruck) and added just a *bit* of adorable twine (The Twinery) to accent it. YAY for cute bits of happy twine! And that, my friends, is my card for you today. YAY! Oh...and for those keeping track...my breakfast this morning is quite traditional - bacon, egg, and cheese sandwich on an english muffin. YAY for Dunks gift cards! HA! Have a VERY Happy Friday! You know what's the MOST fuN about seeing your cards? Having you show us where you get inspiration and how you weave that into what you create! VERY cool! The card is awesome! I DOOOO love a breakfast sammy. However, I NEVER eat before 10:30, so my 'breakfast sammies are usually for LUNCH! And - WHAT???? No CANDY this morning? Oh, goodness! Hugs to you, cutie-girl! what a fun take on the trigger. I am still trying to come up with something. Love that cute little heart. Happy New Year..
love it...I'm a huge fan of yellow and haven't used it in awhile so thanks for the inspiration...happy friday!!!! That yellow made me smile, because really, how can you NOT smile when you look at yellow? Awesome card! Yellow is so fun & happy. This reminds me how much I love yellow and black together...even though I am NOT a Pittsburgh Fan....LOL! Gorgeous work! 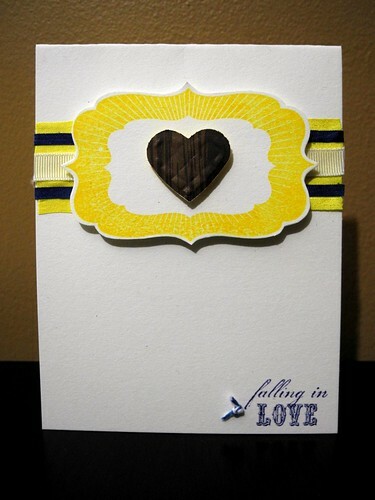 Love this bright and cheery card! Have to use some brightness through these winter months! Great take on the challenge! LOVE IT!!!! The colors are fantastic as is the design. Awesome! Best of luck with that stripey challenge! So bright and cheery, very fun card! It captures that happy falling in love feeling perfectly. What a lovely card full love. Great design, love those stamps you used! oh how cute! everything "fits" together perfect! I love these bright colors as well, I need to use more of the yellow this upcoming year. Great card! I like to try different colors, too. Nice job. You always come up with great stuff. Thanks for showing us. Beautiful card...love these colors too! Always enjoy your fun personality and your work...super cute. Yellow makes me happy. Very nice card. And over HERE it's a good day for it. 50 degrees high and the day before 2012. On a totally different note-I just wanted to tell you I bought the Stampendous Joy stamps because I saw the awesome card you made a few posts back. I'm excited to use it! Thanks! Such a cool card. Love the colors & design! Such a bright cheery card, Jennifer. Love how your TT is interpreted ~ great card!